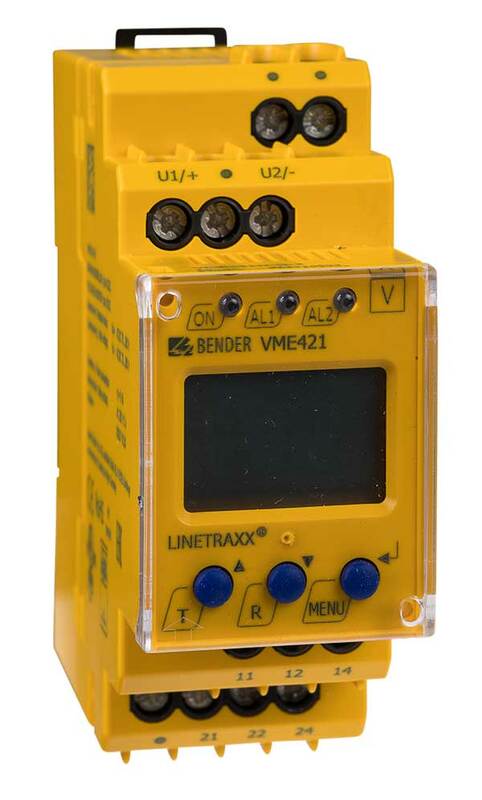 The voltage relays of the VME421H series are designed to monitor the frequency, undervoltage, overvoltage and the voltage between two threshold values (window discriminator function) in AC and DC systems. The voltages are measured as r.m.s. values. The currently measured value is continuously shown on the LC display. The measured value leading to the activation of the alarm relays will be stored. Due to adjustable response times, installation-specific characteristics, such as device-specific start-up procedures, short-time voltage fluctuations, etc. can be considered. Device version VME421H takes the supply voltage from the system being monitored and utilizes an internal energy backup.